KIEV, Ukraine -- Ukraine's president and his top military advisers agreed on a plan for their army's siege of the pro-Russia rebels' biggest remaining stronghold in Donetsk, saying they would seek to avoid street battles in the city of a million people. Ukrainian Army troops receive munitions at a field on the outskirts of Izyum, Eastern Ukraine. President Petro Poroshenko, dressed in military fatigues, told hundreds of troops at a camp near the front lines in eastern Ukraine that recent military victories had strengthened Kiev's position. He said the militants should disarm or face the force of Ukraine's rejuvenated army. "Whoever doesn't hear calls for peace will be forced to put down their weapons," he said, before handing out military decorations. "We shouldn't allow the insurgents to rest. We will free Ukraine from occupation." Mr. Poroshenko said the operation headquarters would be moved closer to Donetsk, but pledged there would be no street fighting. Military advisers said that the army would surround Donetsk and use targeted artillery strikes to hit rebel positions. Around 100,000 residents have left the regional capital since the fighting began in April, according to the city's mayor. Ukrainian forces have gained the upper hand in recent days, forcing rebels to retreat from several towns to Donetsk. On a visit to Slavyansk, a separatist stronghold until last weekend, Mr. Poroshenko poured scorn the idea of restarting talks with representatives of the insurgents, saying two of the leaders were in Moscow. "With whom should we negotiate?" said Mr. Poroshenko, according to Interfax news agency. Mr. Poroshenko suggested the east should be represented instead by locals from the area's metal and mining industries. He has pledged more autonomy for the regions to take control of their own financial and cultural affairs, once rebels lay down their arms. Russia, which has so far ignored calls by militants to send in troops, again called for a cease-fire on Tuesday, but Ukrainian Defense Minister Valeriy Heletey said a truce and talks would only be possible if rebels disarmed. The leader of the North Atlantic Treaty Organization said on Tuesday that Russia is continuing to try to destabilize Ukraine, including through a new military buildup on its border, and that Western allies must push forward on efforts to bolster the defense of Europe. 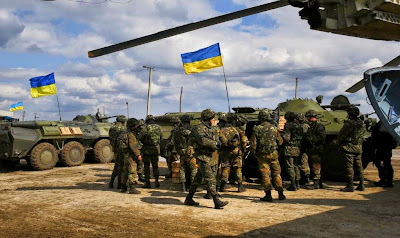 Anders Fogh Rasmussen, NATO secretary-general, said that even though Kiev has gained the advantage in recent days, the alliance must make increased investments in its own military response force and create a more visible military presence in Eastern Europe. Russia hasn't overtly responded to the Ukrainian counteroffensive in eastern Ukraine. But Mr. Rasmussen said that Russia throughout the crisis periodically has made moves aimed at reducing Western pressure while continuing to quietly foment instability. "Whenever the international community puts more pressure on Russia, they take some tactical steps that will defuse the international response, then after a while, they continue covert activities to destabilize the situation," Mr. Rasmussen said in an interview with The Wall Street Journal. Mr. Heletey said the insurgents had mined several roads heading to Donetsk to slow the government's push. The government said that a highway overpass near Donetsk had been destroyed Tuesday, on top of at least four bridges leading into territory they hold on Monday. There had been continuous shooting in and around Donetsk overnight and several explosions were heard, but the fighting had quieted down by the morning, he said. Local health officials in Donetsk said that 30 armed men seized a hospital building. Alexander Borodai, the prime minister of the self-proclaimed Donetsk People's Republic, said in an interview with Russian news website Gazeta.ru that the rebels were preparing to go on the offensive. "We're not preparing ourselves for a siege, we're preparing ourselves for action," he was quoted as saying. "The Ukrainian army and its resources aren't in a state to carry out a real blockade." Kiev and Western officials have accused Moscow of funneling arms and fighters across Russia's porous border with Ukraine to help the rebels, a charge the Kremlin has denied. While the Kremlin ordered tens of thousands of troops it had stationed along the frontier to head back to their bases several weeks ago, U.S. officials say some 7,000 Russian soldiers remain along the border. In a survey published Monday by the state-funded VTSiOM polling agency, two-thirds of Russians polled said they opposed Russian troops going into Ukraine, with only 27% backing military intervention. The West has threatened Russia with tougher sanctions in addition to those imposed on some officials, businessmen and banks after Moscow annexed Crimea. Deputy Finance Minister Sergei Storchak said on the finance ministry's Facebook FB +3.35% page that the impact of sanctions was increased by the fact that they coincided with a slowdown in economic growth. Mr. Storchak said Russia will have to "prepare more serious countermeasures" if the West decides to impose new sanctions against particular sectors of the Russian economy.